We received a lot of positive feedback from our community on social media when it was announced. Truly, it is our community that makes Halifax Yoga so amazing. We look forward to continuing to be one of the best yoga studios in Canada. Be sure to check out Stylight‘s entire article on the best studios in Canada here. Yoga has become an important part of Raechelle’s life, and her practice has helped her grow stronger, more flexible and fearless, both on and off the mat. Raechelle is passionate about her family, writing, being active, reading and adventure. 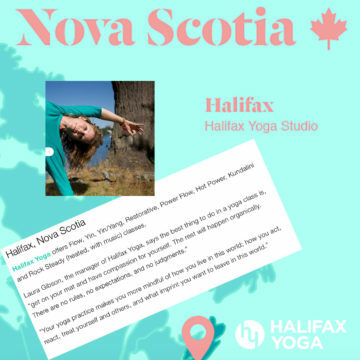 She started out part of Halifax Yoga’s Energy Exchange, then joined HY’s Yoga Teacher Training in the Fall of 2017. She is now the assistant manager at Halifax Yoga and is excited to share her passions and inspirations.